Let’s start at the beginning. How’d you get into bike racing? I raced mountain bikes when I lived in Winter Park, Colorado. I guess I started that probably when I was about 12. I was a ski racer growing up and it was a nice thing to do for off-season training. Eventually I had to stop mountain bike racing because it started interfering with ski racing, but I still rode my bike a lot. Then I had a pretty bad knee injury in 2001 and couldn’t mountain bike anymore so I got a road bike. I instantly loved it. As my ski racing career ended I started riding more and more. I missed being an athlete so I thought I’d try road racing. Do you remember what your first road race was like? Oh yeah. It was horrible. It was in New Hampshire. I can’t remember the name of it. It was pouring down rain so they combined all the women into one category. As a Cat 4 I had to race 56 miles and I’d never even ridden 56 miles. I was riding harder than I ever had, in the rain, and I was dropped. Hard. I gave the crit a try the next day. I had no idea about tactics and of course pulled everyone around the whole race. Then I was out-sprinted at the end. I wasn’t sure if I wanted to keep doing it, but I thought, I’ll give this three tries and see what happens after that. Then in my third race, a criterium at Dartmouth, I won. I was hooked and I liked it a lot. Tell me about how you got from there to breaking into the pro ranks. I was living in Vermont when I started racing. Then I moved back home to Colorado and started racing locally. I was lucky enough to get picked up by a team called Rio Grande Sports Garage in 2006. We went to maybe a handful of NRC races. I had really good performances at each race I went to. The first NRC race I went to was Gila in 2006. I won the criterium. Then at Tour of Tuna prologue I actually beat Kristen Armstrong. There were 18 turns in three miles, so that definitely benefited someone who can take corners at speed. And that was that. I had a few really good performances and was able to get picked up by Team Colavita Sutter Home presented by Cooking Light in 2007. Was it hard to establish yourself and get noticed as a professional rider by big teams? For me, no. I won the first NRC race I went to. I really thought bike racing was far easier than ski racing because all you had to do was ride your bike. If you made a mistake you had two more hours to figure out how to fix it and still have a good result. With ski racing, everything happens at 60 miles per hour and the strength and athleticism needed to have success seemed much harder than just riding your bike. Alison Powers crossing the line smiling. 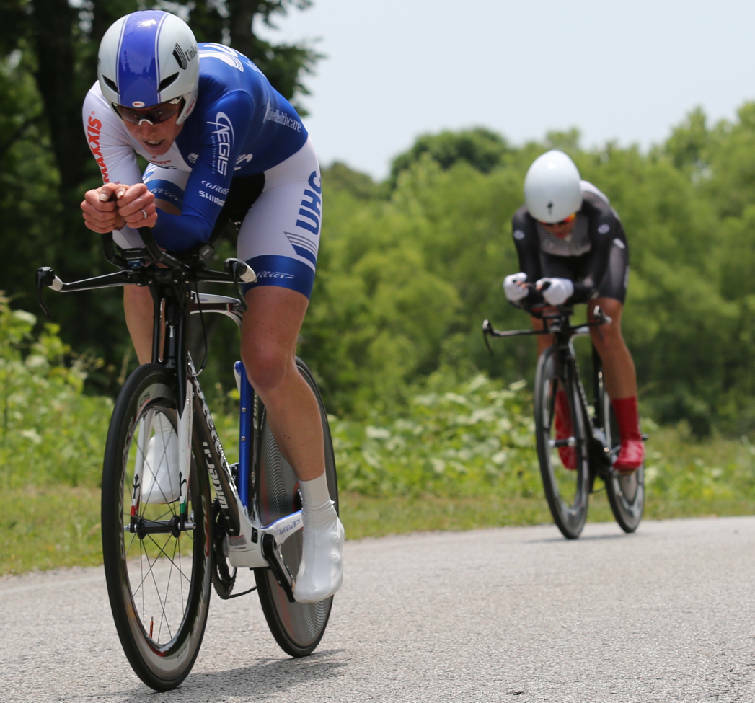 Photo via UHCprocycling.com. 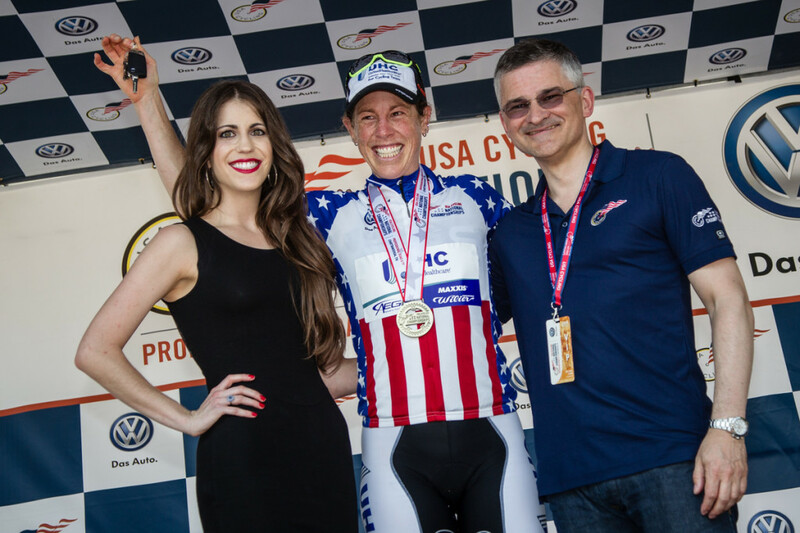 Do you feel like some of that too is that there isn’t the same depth of talent in women’s professional cycling compared to men’s professional racing and certainly ski racing that have much more established development paths? I don’t think it’s lack of talent. I was lucky growing up an athlete and had already figured out how to be an athlete. Whereas a lot of men and women take years to develop themselves as an athlete and figure out what that means, I had already done that as a ski racer. It was easy for me to transfer what I knew about being an athlete to cycling. But also for women, there’s just lack of opportunity. We have, what, four or five teams that travel to all the NRC races and are maybe able to pay their racers? If you’re a woman and you want to go to the NRC races, there’s really a lack of opportunity. There’s not the teams, there’s not the salaries, and it’s really tough. I don’t think it’s lack of skill or ability at all. I didn’t mean to suggest it was a lack of skill. I meant that there’s fewer chances for women to develop as racers and build skills. Agreed. A lot of women race locally and they move really fast from a Cat 4 to a 2 or even a 1. But they haven’t actually been developed. They have no idea how to race. They have no idea how to have the confidence to win at big races. They go to big races and spend a lot of their money and just want to finish and survive as opposed to racing and taking risks in order to win. While we’re on this subject, it seems like conversation about inequality in men’s and women’s racing has been elevated to the mainstream recently. Certainly the documentary Half the Road is helping. What do you think needs to happen to continue moving from a conversation to actually seeing action towards equality? I think we need more women in the industry. Period. It’s not just women’s cycling that suffers. It’s almost all women’s sports. If you’re a former racer and you retire, instead of going and getting a job outside of cycling, we need more people to stay in cycling. It’ll be the women who develop the sport. Not the men who are forced to develop women’s racing so they don’t look bad. Your race career took you all around the world. Do you have a favorite race or place you’ve been to? I really enjoy Tulsa Tough. I liked the race, I liked the courses, I liked the prize money. But also the city has really great restaurants and coffee shops. I met some amazing people through host housing and the race there. That would definitely be a place I’d go visit or ride my bike or recommend as a fun place to go. You know, I like mountains and places with good coffee shops. So Bend, OR is great. Cascade is a great race. And when they had the Mt. Hood race years ago it was always great to hang out in Hood River. Even before I had good success there, I really liked Chattanooga, TN. I wouldn’t mind going back there for a riding vacation or hanging out. 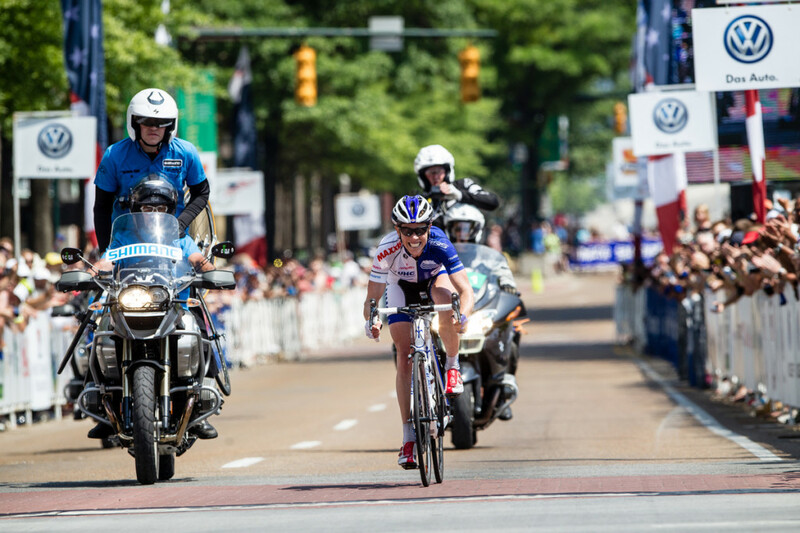 Alison Powers winning yet another national champions jersey in Chattanooga, TN. Photo via UHCprocycling.com. Did you have a lot of opportunity to race in Europe? I did, which was really nice. In ’07, I raced a fair amount with the national team. Then again in ’08 with the opportunity to go to Beijing [for the Olympics]. Then I realized I really didn’t like racing in Europe. I didn’t like only being a bike racer and living with bike racers. I wanted to be in the U.S. and win races and earn money and have a real life other than being a bike racer. You felt like you needed some balance outside of bike racing to make your racing life work? Yes, because it wasn’t fun. I started bike racing just to have fun. Not to earn money, not to go to the Olympics. Racing in Europe was not fun for me. It was miserable. I came home and raced in the U.S. and had tons of fun. Why was it so miserable? First, the lifestyle off the bike. At that time I was with U.S. national team people so we raced together, we trained together, we lived together. Everything together. And then the racing is just so hard. The opportunities for success are so small because the depth there is giant. Spending those two years in Europe was great for me because I became a far better racer than had I stayed in the U.S. That’s for sure. But I was just getting beaten in like every race with no success. From the outside, it certainly seems like going and racing in Europe is the dream for every pro racer. It’s interesting to hear you talk about the reality of it. Staying with three people in the little baby hotel room with no air conditioning, eating pasta and red sauce for breakfast, lunch, and dinner. I don’t like that. Alison Powers deep in the pain cave and ahead of Carmen Small at the 2014 National Championships. Photo via timesfreepress.com. Perhaps this is a silly question, but how did it feel to win the three road national championships in one year? It felt amazing. I couldn’t believe I’d accomplished something like that. All I’d set out to do that season was win the national time trial title. Winning the criterium in 2013 was an extreme bonus and definitely not expected. After that some people started saying, “you could win both [the time trial and the road race].” My fiance Josh was the first to say I could win both then hold all three. I thought he was crazy. Mara Abbot, my teammate really, really wanted to win the road race. And that was totally fine with me. It was time trial or nothing. And when I crossed the finish line [at the road race] I almost felt like a hoarder. I felt bad that I held every single title. It’s still is so amazing to hold the two titles for another four months. I always thought people who won multiple titles, like Kristen Armstrong, had something special I didn’t have. And I consider myself just normal. For me to accomplish something like that is really pretty cool. Last season was one of your best. Why did you decide to retire? Well, I’ve had other seasons where I’ve won more races. I’ve won the NRC title twice. I’ve won a lot of stuff. But the big event races were eluding me. I just couldn’t figure it out. Finally with some help from the team and my fiance, who again knows me better than anyone else, figured out I have head case problems at big events. Conquering that was pretty hard, but actually rewarding. To be honest, at the end of last year, I knew I was finished anyways. But I’d signed a contract with United Healthcare already and wanted to commit to them. I said, OK this is my last year of racing, I’m going to do it 100 percent or else why even bother? I think that gave me a little bit of mental edge, knowing I never had to do whatever race again. Like at the time trail at nationals I dug amazingly deep in the pain cave because I knew I’d never have to do it again. Do you think you’ll race at all for fun? *Laughing* Uh, no. One thing is right now, I have absolutely no desire. I wasn’t enjoying the racing at all last year. And then, I retired from USADA, United States Anti-Doping Agency. If I was ever to race a sanctioned race again I’d have to go back in the testing pool for six months. Having the freedom to not have to worry about telling USADA where I am at all times every single day is a giant weight off my shoulders. If I wanted to do a little local criterium, it’s not worth the six months of telling USADA where I’m going all the time. Who in the women’s pro field are you excited about among the up and comers breaking onto the scene? I think Lauren Stephens is going to be really good. She just won the time trial down in Argentina and was second over all. I wish I could say she was on my old team United Healthcare, but she’s on TIBCO. As a team, the way United Healthcare works together is just unbelievable. I think they’ll still be an amazingly strong force. Then of course Corinne Rivera. She is amazing. I pick her for the road race this year, actually. Do you feel hopeful that things are heading in the right direction with more teams, more money, etc for women’s cycling? I see more races and more race opportunities for women. Which is really, really great. More prize money, more effort put into the races. The teams, unfortunately, I don’t see any growth there. There’s still tons of women who want to go to all those sweet new races that have absolutely no way of getting there. It’s great all these new races are UCI races, but how many UCI teams are there in the U.S.? Not very many. The races are there, the opportunities still are not. I had a really great year with United Healthcare last year and I think they’re really raising the bar for women’s teams. Not only giving women riders an opportunity but treating them like the men. They stay in good hotels, have a staff of a couple soigneurs, a couple mechanics. We were really treated as equals. That’s another thing that’s missing is so many women’s team try to operate on a really low budget. How can you be a bike racer if you’re sleeping on the floor of a host house? To start, to be at home and enjoy life a little bit. I’ve been an athlete for a long time, from ski racing at a high level, then bike racing. It’s always been a training plan and worrying about my sleep and my recovery and my diet and my weight. After 20 years of that, to not have to worry is really, really nice. As far as a job goes, I started a coaching business about five or six years ago called ALP Cycles Coaching. I’ve been really lucky in the past several years to slowly build that business knowing that was my sort of out from bike racing. So it’s been a really easy transition knowing that I had this in my back pocket. We just did a training camp down in Tucson, something we wouldn’t have been able to do before. I’m really able to help my athletes more now that I have more time and energy to devote to coaching. I’m really excited to be coaching now and to have that opportunity and want to thank all my athletes and all the supporters of ALP Cycles Coaching. This entry was posted in Interviews, Racing and tagged alison powers, alps cycles coaching, carmen small, corinne rivera, half the road, kristen armstrong, national championships, professional women's cycling, time trial, uhc pro cycling, united healthcare cycling, women's cycling. Bookmark the permalink.